December 2014, I sat down as I do every year now, to start my goal setting process for the year ahead. This exercise has now become the most important ritual I do every year, as it allows me to stretch myself, become accountable to me, and also sets the agenda for the weeks and months ahead. Each session comprises the same subject matter including fitness goals, health goals along with business and entrepreneurial goals. I also include a couple of other very private goals, that normally evolve around deeply personal issues or challenges I have, that I want to eradicate, resolve or make better. Point of note, goal setting is not an easy thing to do, but it is a worthwhile exercise trying to understand it and to bring it into your life. It’s important that your goals are realistic, achievable but also really stretch you, getting you out of your comfort zone. The most important part of the exercise is to write them down on paper and review them every month as you work through the year, making yourself accountable to the commitments you made to yourself. What you tend to find is that if you fail to write them down, they will disintegrate into the atmosphere, and become known as pipe dreams. For anyone that doesn’t know, to complete an Ironman race, it involves swimming 2.4miles in the sea, cycling 112miles on the bike and running 26.2miles, all on one day and within the 17 hour cut off time. At that time I think I had two short sprint triathlons under my belt and could just about swim; so suffice to say I was a complete novice in the sport of triathlon. However I really wanted to find something that I felt was nearly impossible, just to see how far I could go. The Ironman challenge would be accepted by many as one of the toughest endurance races anyone can take on, and certainly for someone living with Multiple Sclerosis, it could be viewed as something that would not only be tough, maybe impossible, but also quite dangerous and possibly ridiculous. To cap matters off whenever I started to do my research on the race it certainly was not heartwarming to discover that almost fifty people who started the race, never finished it, with many perishing in the water due to heart attacks or stress related incidents. As you can imagine quite a bit to take in and a fairly big goal in anyone’s book. Thankfully in just over fifteen hours and in the beautiful island of Majorca, I achieved my goal of becoming that Ironman in September the following year, allowing me to tick another goal off my goal sheet during my monthly review – an incredible feeling. I was greeted at the finish line in Majorca by my family, who I think were simply glad to see me come home alive, after a grueling, long, challenging day in the heat. Last Sunday I completed my sixth Ironman race in the last twenty-four months. It was a 70.3mile distance race this time, which is half of the full Ironman distance, however still a hell of a challenge. It took me just over six hours and twenty minutes to get around the course of which I was very pleased with, largely due to the fact I was considering pulling out twenty four hours earlier with bad health. I have to say that I have a lot to thank Ironman for, as over the past two years I personally believe it has played a huge part in my overall health, helping me manage and beat my MS in the process. People often say to me how the hell could anyone complete an Ironman race – and I say back to them very simply” it’s all about the training”. If you are considering becoming an Ironman, you must be willing to complete the training program. Six month is the accepted training timeline to get your body and mind ready for a race of this nature. I don’t care who you are, or what your athletic ability is right now, but if most people committed to the training schedule then I believe most people can become an Ironman. I have been thinking about my journey of recovery quite alot over the past few months. Eleven years living with MS alongside becoming a dad, running a business, just simply trying to cope and manage with everything life has to throw at you. I have to say it has been very difficult at times, challenging, mentally and physically tiring, but also extremely rewarding. I am also very grateful that for the most part I have been one of the luckier ones, who has been able to manage my condition quite well. I say lucky, but maybe that is being slightly unfair to me. I recognise that I work incredibly hard at my health and to keep my MS at bay, which thankfully has meant that I have been able to live a very normal adventurous life. 1. Exercise To compete in an Ironman race, it is essential that you have a certain level of fitness, therefor almost compulsory you enter into what is pretty much a daily training routine. Not only will you be swimming, running and cycling for six months, but you will also be stretching, meditating, undergoing massage therapy among possibly other techniques to facilitate the body’s recovery. This has made an incredible difference to my fitness levels, strength levels and overall conditioning. It has also facilitated the healing process within my body, allowing it to heal and deal with many of the symptoms MS patients have to deal with on a daily basis. 2. Nutrition whenever you embrace endurance racing or are introduced to exercise in general, it is likely inevitable you will start looking into what you are eating and becoming more food conscious. This is a major part of the Ironman scene as many athletes engage in copius amounts of research around what foods they should be eating, what is healthy, what facilitates recovery and so on. In fact it was Ironman research that ultimately led me to the incredible documentaries on Netflix, including Forks over Knives, Food Choices Documentary and What the Health. These films are hugely informative and them along with many plant based whole food athletes who I have also become accustomed to by embracing the Ironman world, have ultimately inspired me to go down a particular nutritional path in life. Being a person living with MS, this has been an incredible coincidence and beneficial development as it just so happens that a plant based whole food diet is one that is complimentary to MS recovery as it limits and restricts the amount of cholesterol and saturated fat entering the diet. I have no doubt that Ironman has been one of the catalysts for me to go down this pathway in life in respect of food and how I decide to fuel. This has been a game changer for me in more ways than one. 3. Mindset “You are what you think you are”: I embraced personal development almost ten years ago as I was really struggling to come to terms with my illness. In the early years of diagnosis, my health was particularly bad, and as my symptoms became more difficult to deal with, my thoughts and mindset started to become very unhealthy. In my first book, Attitude Is Everything, I speak more about this but whenever things were particularly bad and overwhelming, suicidal thoughts often flickered through my mind. I was losing hope and belief fast, in what the future might hold for me, my family, my aspirations in life, and on many occasions was struggling at times to force myself out of bed. If there is one medicine for this kind of thought process in the world right now to rectify any form of negative thought process, it is to train for an Ironman race and cross the finish line. The feeling, once you achieve this goal is absolutely incredible, and for me on a very personal level was life changing. I was only too aware what my doctors were saying, what the medical profession were saying, what some of the people who knew me where saying, but what I knew deep down, was that if I stuck to my plan, I would achieve my goal. 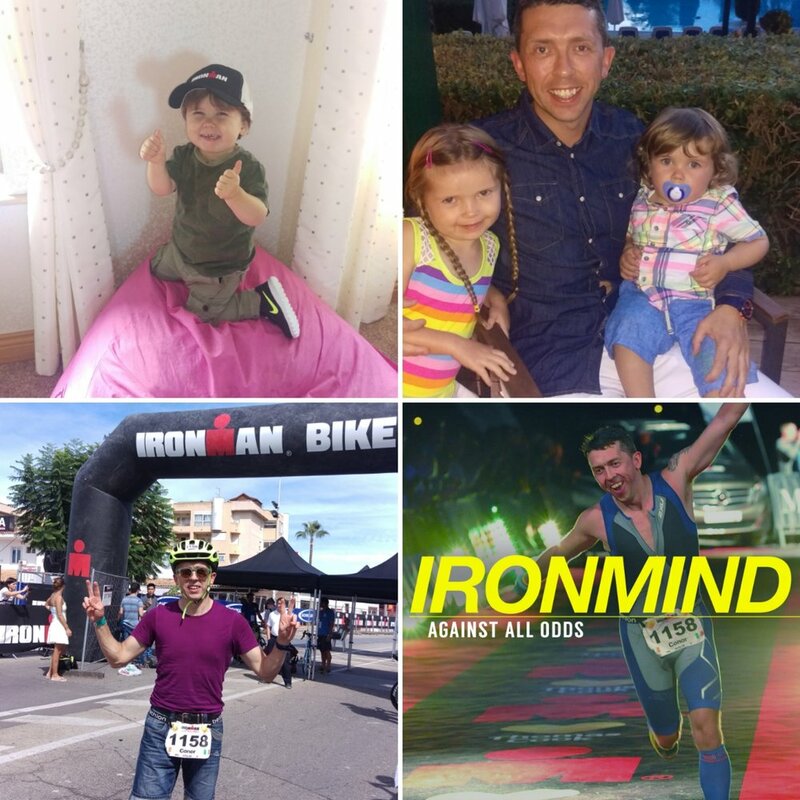 Becoming an Ironman triathlete is certainly one of the greatest achievements of my life to date, and has made an incredible difference to my mindset, my thought process, and how I live my life. I talk more about this in greater detail in my new book Ironmind, Against All Odds. Why don’t you go get a copy, you might enjoy it. 4. Family I have two young children and as I went on this adventure Journey in 2015, I’m glad to say and report what a positive impact it has made on my family and my relationship with my children. In our house we don’t eat meat or dairy, eat lots of fruit and vegetables and we often are out playing, running, cycling outside as a group. The conversation in the house even though my kids are very young, is often about good healthy food, and how important it is to be healthy, to exercise and so on. I have been literally amazed how my young son for example, who is four years old, has taken to this like a duck to water. My mum has a great saying “if you rear your pup, you’ll have your dog” thankfully so far my kids have loved the Ironman journey and it has made a really positive impact on them and the environment we keep, and how we lead our daily lives. Both my kids have watched me race, love the events, and even refer to themselves as Ironkids – fascinating to watch but really rewarding at the same time. I have no doubt that by me embracing Ironman, this has had a very positive impact on my family and in particular the children. 5. Purpose I think in life everyone of us wants to feel some sense or kind of purpose. It’s healthy at times for each of us to ask ourselves what is our purpose in life, why are we here? What can I do better? How can I become a positive influence on others? For me Ironman has given me the gift of an incredible sense of purpose in life. I am very aware of how empowering my own story of recovery is for others, due to the severity of the challenge, and this is one of the major reasons why I continue to push myself through the pain barrier and out of my comfort zone. Last Sunday thirty minutes into the swim in the Irish Sea in Dun Laoighaire, I was there all alone in the water, concentrating on my stroke, thinking about life, where I’ve come from and what I’ve achieved to date. It was exhilarating to be healthy enough to be in the sea with over 2000 other competitors. I have come to realize when I do these races it’s one of the few times in life that I feel truly alive. Alive and alert to what I am doing at that moment in time. Being present, focusing on the job in hand, listening to my heart beat, making sure I’m healthy enough to continue racing. It’s really an incredible feeling, a great buzz. Ironman triathlon gives you a sense of purpose, a reality check, you need to be on your guard, sharp, have your wits about you because quite frankly if you do not, it can be pretty dangerous. As I crossed the finish line last Sunday with a great guy called Anthony (who I met at mile 2 of the run), it was another incredibly proud moment for me. A super feeling of achievement, accomplishment that against all of the odds (yet again) I was able to swim, cycle and run over seventy miles, and also enjoy it. Over the last two weeks many people have contacted me again to say how this was the little push they themselves needed to start doing a goal setting exercise of their own, and get out of their own comfort zones. This is always brilliant feedback and keeps me motivated to keep pushing on with my own goals and aspirations in life. 2017 has been another great year for me on the endurance and health front. I continue to set and smash goals, train every day and keep on top of my MS. The next few months I will continue to train and work on my mindset, my nutrition, and my health. I have a lot to be thankful for and also more particularly a lot to thank Ironman for. I’ve listed five major reasons how Ironman has helped me beat MS, but I just want to add that there have been many more positive aspects to becoming an Ironman triathlete including bringing incredible discipline to my life. Discipline is a fantastic characteristic to have in abundance, no matter what it is you are trying to do or accomplish. Discipline, Inspiration, motivation, resolve, grit are all by products of competing in these kinds of races. The return on investment is tenfold, but guess what – it requires massive action – by YOU. The question is – are you up for the challenge? If you are, watch what happens in your life for the better.